For our Christmas special this year we are reviewing the events that occurred in 1964 at the Kandala Mission Station. To read Part 1 in this three part series, please click here. You might ask, why review those evil days? Because as we comprehend what was done, we see how deep the Father’s love for us truly is, how tremendous the forgiveness offered us through Jesus’ death and resurrection. We can appreciate His gift to us all the more. Without that gift, we would have no reason to celebrate Christmas. The Kandala Mission Station was burned to the ground in 1964 by members of the Congolese-led Simba group. The Simba (Swahili for “Lion”) rebels were born of a new conflict against the four-year-old Congolese government. Along with a communist political worldview, the Simba incorporated aspects of their African worldview with its animistic beliefs and practices. They roamed in groups bringing terror, death, and destruction wherever they went. During 1963-64 their attention was focused along the Kwilu River. The following excerpt is taken from Jim Bertsche’s story in The Jesus Tribe: Grace stories from Congo’s Mennonites, 1912-2012 edited by Rod Hollinger-Janzen, Nancy Myers and Jim Bertsche. Photo above is also courtesy of Rod Hollinger-Janzen from the same book. The first warning Pastor Emmanuel Wayindama and his family had was the sound of excited shouting in the distance and the sight of shadowy figures leaping about, systematically setting fire to the thatch-covered homes of Bible Institute students. 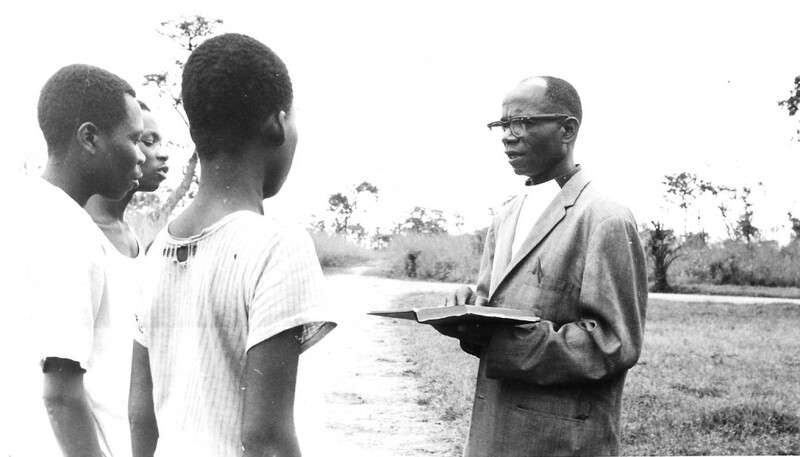 Pastor Wayindama had been brought to Kandala in the fall of 1963 to serve on the teaching staff of the AIMM Bible Institute. An earlier graduate of the institute, he had demonstrated not only a keen mind but also a deep commitment to his Lord and to the church. When the search was on for Congolese to join the teaching staff at Kandala, Pastor Emmanuel Wayindama was an early choice. The institute had been displaced from Tshikapa on the banks of the Kasai River some 100 miles to the east because of the tribal conflict that had erupted there after the hastily granted independence in 1960. Unfortunately, the move placed the institute in a territory where a different kind of unrest was brewing, in which missions were often a target. On this violent night in January 1964 all along the Kwilu River both Catholic and Protestant mission posts were attacked. In the rebels’ view, missions had partnered with the hated Belgians and needed to be eliminated before the country could be reconstructed for the good of all. As rebels arrived at the small thatch-covered home of Pastor Wayindama, his wife and family managed to escape into the surrounding darkness but the pastor was intercepted. From that point on the interrogation was accompanied by a hail of blows, some with fists, some with the arrows and wooden arcs of the bows carried by each rebel. Pastor Wayindama was soon bloodied and beaten to his knees. The rebel leader was speechless. He had fully expected to see the pastor grovel at his feet pleading for his life. For a long moment he stared at him, then turned and ordered his team elsewhere. Pastor Wayindama lived to lead student families to safety across some 125 miles of dry, hot landscape, limping painfully all the way. His experience and witness are part of the precious legacy of the Mennonite Church of Congo. God’s Word has power to convict hearts. Praise God it convicted the heart of a young man bent on terror. Can you imagine the heartache he would have experienced one day if he had murdered that dear man of God? The terror he intended would have come back to torment his own soul. We have one more part of this story to share. Join us this Friday for Part 3 of this series. To review Part 1 click here.